Why Whittier? Why ask why? I’m a city boy through and through; nothing gets me more excited than the hustle and bustle of the crowds on a New York City street, the smell of roasted peanuts at the Nuts4Nuts cart, or the flashing lights of Broadway in Time Square. I like to be where the action is; however, even I need a break from the city, a city that so enormous that they had to name it twice: NY, NY. Once I decided on a trip to Alaska, I was immediately amazed by how many folks, all from the lower 48, assumed I was going on a cruise. 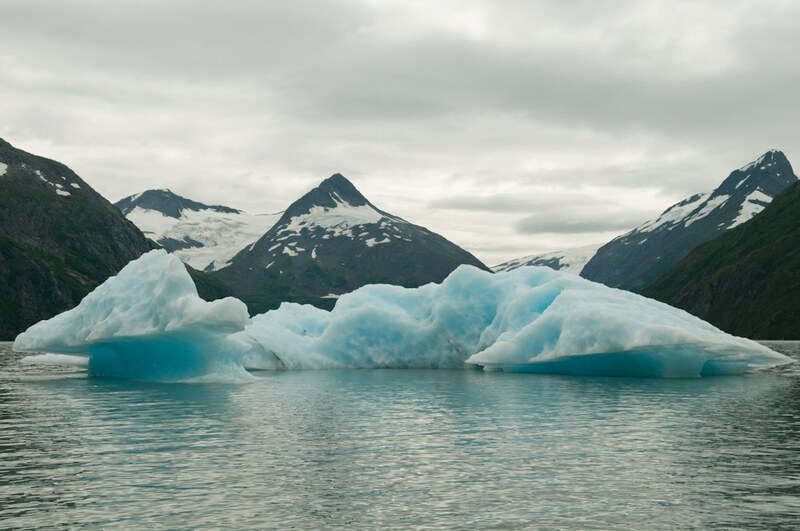 When I thought about cruising Alaska, my mind instantly turned to visions of retirees looking at glaciers through binoculars while standing on the deck of a cruise ship. I wanted an action- packed vacation full of adventure and excitement. I wanted to know the culture, not just the glaciers. So I said to myself, WWAD? (What would Alaskans do?) And so with that in mind, I departed Philadelphia for Anchorage, rented a car, and my adventures began. I arrive late, around dinnertime and what better to do than to head to Humpy’s, a local Anchorage bar. Tonight it’s Little Neck Clams and an Alaskan Amber. Served with a few slices of bread to dip in the broth and to eat with the clams, I quickly discover liquid crack, and like a good narcotic, I’m hooked! Darwin’s Theory, another great local bar where more Alaskan Amber and Alaskan White is consumed is next on the list. I prefer the Alaskan white, similar to a hefeweizen. Much to my surprise, I learn at Darwin’s Theory that most Alaskans are actually transplants and all were extremely hospitable. The next morning I arrive at the Anchorage Museum, which was beautifully renovated and serves as home to some amazing pieces from the Emergence: Contemporary Native Art and Design Exhibit. I could have spent days there reflecting on all that I saw. Next stop, Chugach State Park, complete with a hike to Flattop Mountain that leads me to a grandmother picking wild blueberries. From this wise sage, I learn that Alaskan’s do a lot of canning and preserving of fruits and vegetables because it’s so expensive to ship fruits and vegetables to Alaska. Additionally, since it doesn’t get too terribly warm here, their growing season is quite short and they need to make the most of this window of opportunity. Once I leave Anchorage, I drive the scenic Seward Highway to Whittier. As I drive, the Turnagain Arm, I don’t think photos or my description can do these mountains justice, their majestic heritage is displayed all around me. Simple in grandeur, trees line the lower half and glacier-sculpted rocks consume the top portion. It seems soft like silk, with a smooth drapery of snow that rests like hot fudge on an amazing rocky road sundae. At the Alaska Wildlife Conservation Center, I visit Jack the Moose – yes, he even has a Facebook page with more friends than I do. It’s quite humbling! I find myself back on the road to Whittier because honestly, who wouldn’t want to travel through a one-way tunnel that only allows cars into it on the half hour and out on the hour? It’s quite the experience. If you’re headed through here, make sure you check the time because the tunnel closes at 11pm for the night, so once you’re in, you’re in. Being a foodie, I’d be remiss if I did not mention that Swiftwater Seafood Café has the most amazing Pacific Cod fish and chips. The cod, like butter, melts on the tongue. Even those who don’t like fish would think twice once they tasted this dish. The cod was fried ever so lightly with a thin dusting of breadcrumbs. And let’s not forget the Rhubarb Crisp for dessert, topped with vanilla bean ice-cream. What a perfect way to end a meal. Looking back on the trip, I realize that Alaskan’s fry food perfectly; others had overcooked the fish to death, killing any trace of true flavor. Waking up in Whittier gave me a glorious view of Prince William Sound. With the morning sun rising slowly, the mountains and water illuminated to perfection! The stillness of the water is breathtaking—a still mirror that reflects the beauty that surrounds it. Breakfast at the Lazy Otter – complete with eggs and reindeer sausage (sorry Rudolph); Reindeer sausage is a lighter and less potent version of kielbasa. The best thing, too, is that the taste doesn’t make a return visit like traditional kielbasa. Those of you who know kielbasa know all too well what I’m talking about. My apologies to all my Polish ancestors. Back through the tunnel and off to Hotel Alyeska for the Alyeska Resort Blueberry Festival. If you’re thinking I’m going to talk about the amazing blueberries, you’re wrong. I would have, but sadly, there were none. Who hosts a blueberry festival without blueberries? In their defense, they had blueberry wine, but it was early and I was driving to Seward. Before that, I stop to hike the Portage Pass and to see my first glacier in person, but not from the deck of a cruise ship. As I sat and soaked in the view, many glaciers sat in beautifully blue water, like ice cubes in my freshly shaken Blue Hawaiian cocktail. It was intoxicating! A tour guide told me that it rained last summer for 32 days straight, so to have amazing weather thus far, I was truly lucky. Rain was in the forecast today, so I suited in my Gortex, and headed to the docks for my noon tour of Resurrection Bay with the Kenai Fjords Tour. With an hour to spare, I check out the sites around town. I see a local fisherman guide hanging fish for that “prize photo shoot” with the fishermen that caught it, so I do what most tourists would do; I join in and start taking pictures. 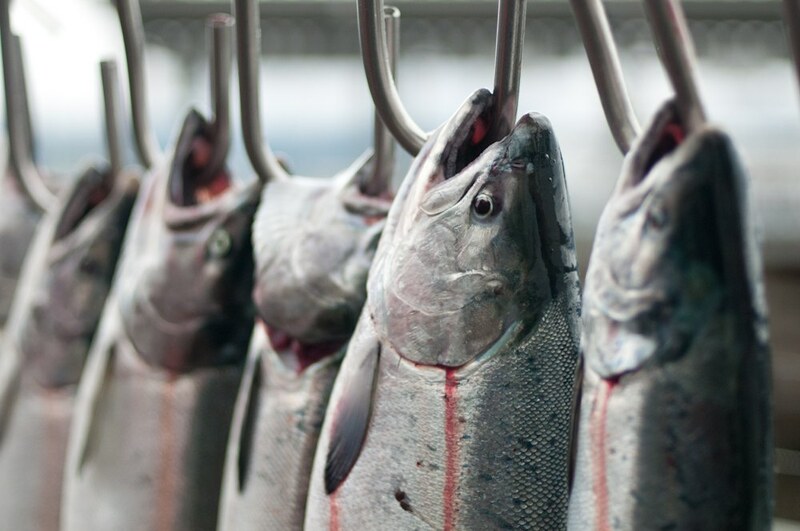 They hose off the fish and begin filleting them; Halibut, Salmon and Cod are the feature fish for the day. You don’t see that every day in NY, NY. Intrigued at the speed and precision of these fish being filleted, I start talking to the guide. He’s been doing this for years and can obviously multitask; he talks to me and fillets like the wind at the same time. I’m amazed. He must sense the foodie in me, since he cuts a piece of raw salmon for me to taste; the result: it is the freshest sashimi I have ever tasted. As he continues to fillet the fish, a plethora of fish eggs appears – hello salmon roe. He tells me that I can eat as much as I want. The salmon roe melts in my mouth like the oozing chocolate from a warm soufflé. On my boat tour of Resurrection Bay, I see hoards of puffins. To add to this, I see my first bald eagle outside captivity. I instantly realize that eagles possess all the qualities they stand for: pride, vigilance, confidence. Up and out to Nellie’s for breakfast, that’s Alaska Nellie’s place. 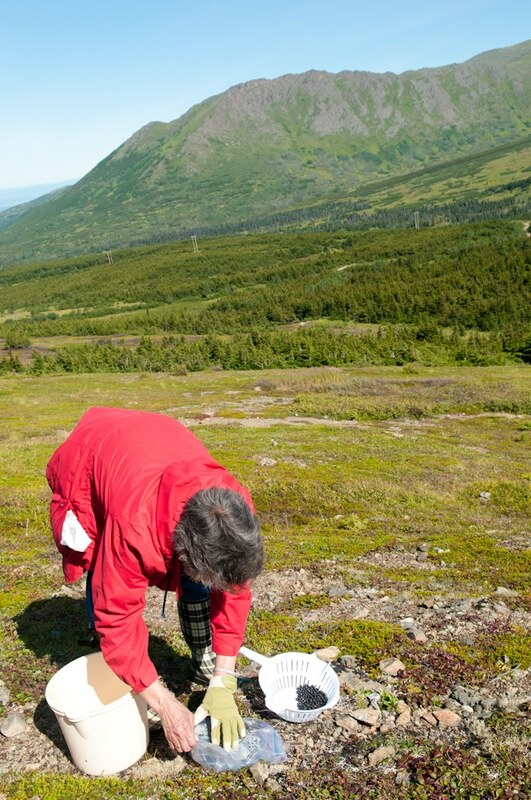 Talk about a pioneer; this woman helped the lives of many panning for gold in Alaska. It’s a place rich with history and nostalgia. With a short drive, I’m off to hike Exit Glacier, a massive but rapidly melting glacier. While hiking, I see a sign with a picture of visitors from 1998; it’s amazing how much of this mass has actually disappeared in just 13 years. If this doesn’t make you want to pay attention to climate change, I don’t know what will. As I sit and reflect upon this massive piece of solid ice, I overhear a guide say, “If you close your eyes, you can still sense the mass of ice before you. Feel its ‘breath’ as air by the glacier sinks, creating a catabolic wind. Listen to the creaks and groans telling you that gravity is pulling Exit Glacier down the slope. Hear the melted water flow through the cracks in the ice – sometimes in small drips, sometimes in raging currents. Now open your eyes and look for the glacier’s signature blue glow in deep crevasses. When light passes through ice this thick, all the colors of the spectrum are absorbed except blue.” This is a living, breathing metaphor for beauty. I mentioned I wouldn’t be “cruising” this vacation, but that doesn’t mean I won’t experience the waters of Alaska. I would strongly recommend the “Upper Kenai Scenic Float Tour” with Alaska Rivers Company in Cooper Landing, followed by a 1.5 mile hike of Skilak Loops’ Hideout Trail. This is where I had the distinct pleasure of meeting some new friends that even dined with me and my friend at Sackett Kenai Grill; I strongly recommend the Cod Fish Tacos, and so do my new friends! 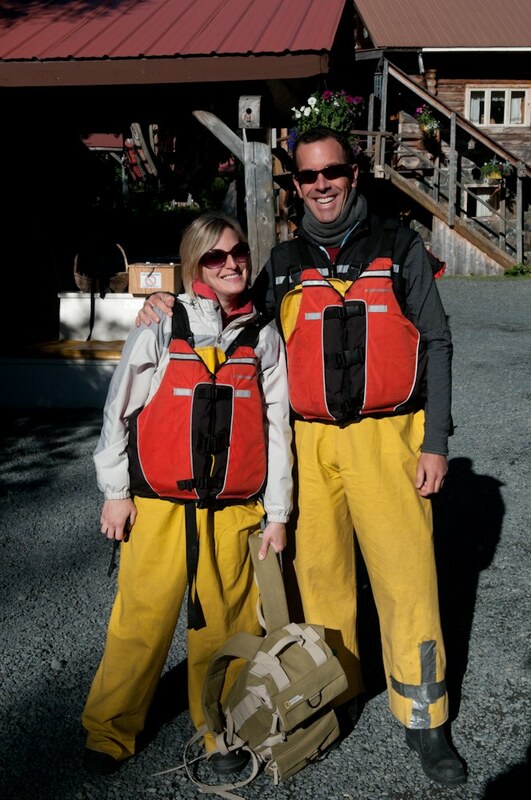 Suzanne and Michael at the Alaska Rivers Company – Cooper Landing, AK. Throughout my adventure, there is not a cloud in the sky. As I hike the mountain, I stop to soak in its beauty and it occurred to me that there was nothing in sight except for the breathtaking bounty nature has to offer me. I didn’t see a single home, road, tower, or person throughout. It was simply me with God’s magnificent mountains, this flowing river and still lake. All around me, Alaskan fireweed swept down the mountainside like a dusting of pink chiffon. It’s times like this that I realize the philosophy of yin-yang is a good thing – the concrete jungle where dreams might be made could never compete with the majestic beauty of Alaskan scenery scape. On my drive to Homer, via Cook Inlet, I stop in Clam Gulch and the Russian town of Ninilchik. As I peer out the window on this clear day, I see the illustrious Mt. McKinley, yet it’s over 500 miles away, but the visage is near perfect! Upon my arrival, I head to Homer Spit. Having just turned 35 years old, I’ve been awaiting this epiphany to learn where I’m supposed to be in life: should I still be working in Corporate America? ; should I sell my home? ; if I die today, what mark will I have I left in this world? ; what have I done that would bring meaning to my life or to others’ lives? 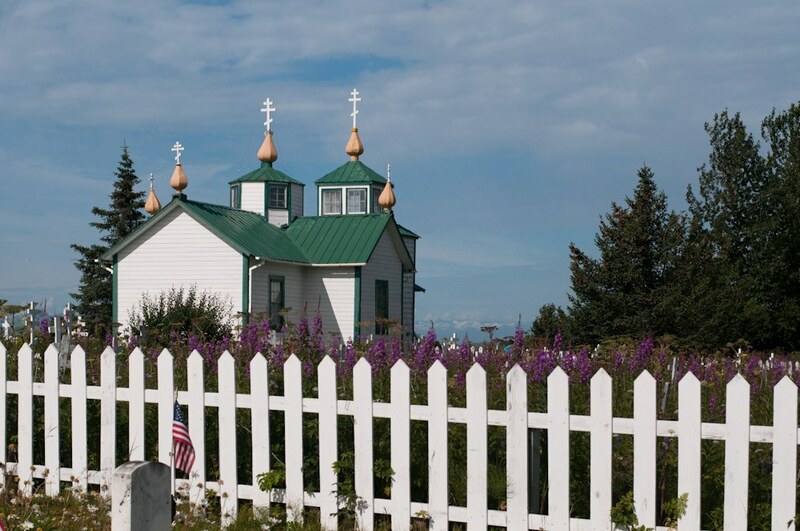 Russian Orthodox Church in Ninilchik, AK – Established in the 1820’s, Ninilchik is the oldest community on Kenai Peninsula. Then, enter Joan from Maryland, who recently relocated to Homer, AK and who recently married after the passing of her first husband. Her new husband, Bill, who lost his wife, was a neighbor of Joan’s. From these two tragedies, a great love story emerged. As I share my story with Joan, she affirms my many thoughts and reminds me that decisions in life are not a sentence. Indeed, we can always change our minds about where it is we believe we should be. She continues to say that she has learned to live in the moment; we don’t always have tomorrow, so there’s no need trying to live five or ten years in the future. At some point, we have to live our lives for ourselves. And like the eagle hatching from its egg, the time comes when we must leave the comfort of the nest, spread our wings, and fly on the open air. We must allow the wind to take us to where it is we believe we belong. Breakfast at Two Sisters, the pecan sticky bun is fantastic! Warmed to perfection, and with the biggest pecans I’ve ever seen, I had a hard time sharing this with my best friend, Suzanne. Sharon, owner and master baker, has a gold mine! I begged her to come to Philly and to open a Two Sisters there. I’m afraid if you want to taste her masterful creations, however, you’ll have to go to Alaska! In my adventure to do what Alaskans would do, I head to the Norman Lowell Gallery; he’s been painting the beauty of Alaska for over 20 years. I’ve never seen an artist use so many mediums and actually capture the reality of the image so perfectly. That afternoon, I venture back to the Spit and eat at Captain Patties. A trio of broiled halibut, salmon, and prawns serves as my final meal, like a soul on death row. The reality of this final dinner is a rude awakening for me because tomorrow I will be back in city of Brotherly Love, the land of “wiz” on cheesesteaks. Little fresh, buttery, and scrumptious fishies – how I will miss you so! My brother is a world traveler and often goes exploring alone. To me, travel is more precious when shared with someone. 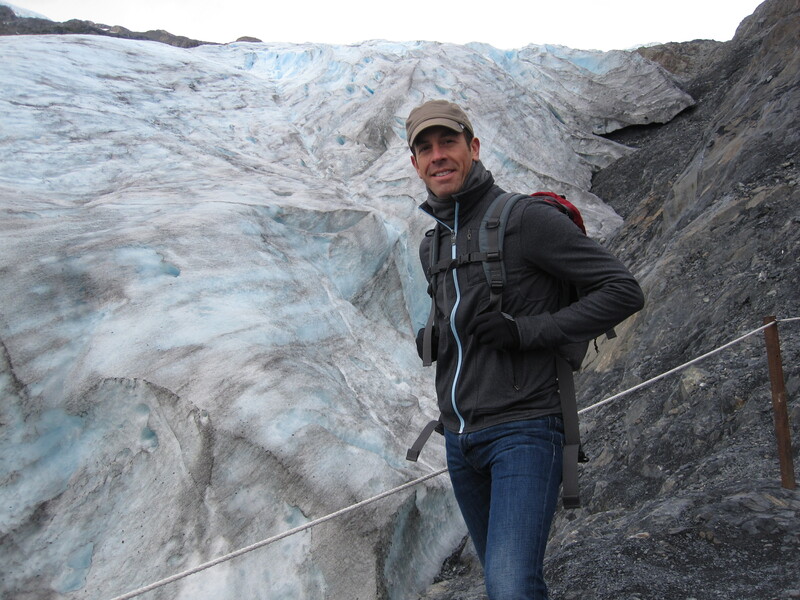 I’m glad I was able to explore Alaska with my friend and photographer, Suzanne Tenuto. Fish is so much better when shared with two, wouldn’t you agree? 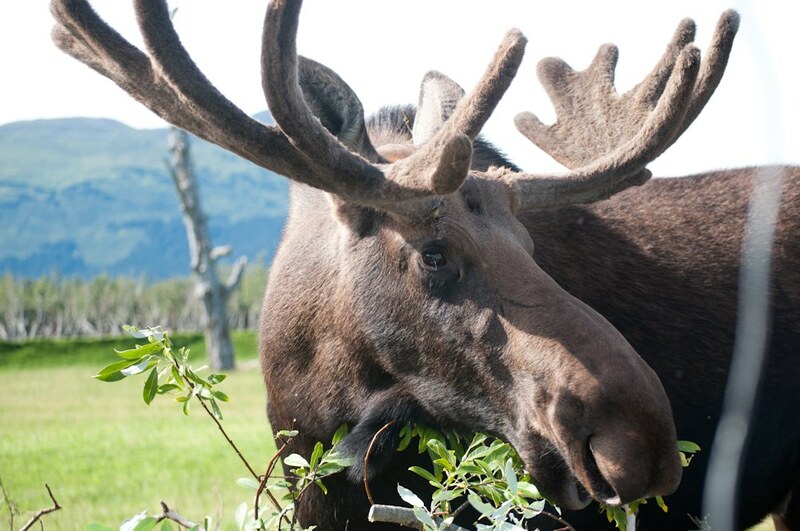 Check out more of Suzanne’s photos from Alaska. She’s a photographer based in Philadelphia who primarily focuses on portraiture, but I l love her travel photography as well: landscapes, food, and wildlife. She blogs at: http://suzannetenutoblog.com/ Follow her on Facebook or Twitter. And you told me that writing wasn’t your thing?! The inspiration of nature and food is hard to deny. I think I should take some of your learned wisdom and reflections to heart. It’s easy to get caught up in the everyday and forget what life has to offer. Alaska is definitely on my list. Love the photos!! And thanks for my postcard! (At least it didn’t take a month and a half). However, I’m sad to learn Rudolph isn’t coming with Santa this year. Mo, you are too funny. Travel and food is where it’s at! I say we conquer wine country, there will be plenty to write about there. To boot, it will be a second go around for both of us, so we’ll be pros! Or there’s always Seattle, hmmm…decisions, decisions! Ah, I learn from the best. Thank you Mother for instilling this ‘Bug’no with the travel bug! Where to next? …like I told you Michael, writing is truly your calling in life! Thank you for sharing your thoroughly descriptive experiences throughout Alaska. Believe me, you have even tempted your ‘‘Greek Goddess” to want to go visit Alaska! Go figure! I will pass this along to friends and family and who knows…Alaska will be the next ‘Cancun’ for travelers! Despina, coming from the Greek Goddess, I am truly touched – Thank you. Funny, the locals all told us that they head to Mexico to escape part of the winter – they hit the west coast and visit Puerto Vallarta. I think I need to travel back to Greece with you next time. 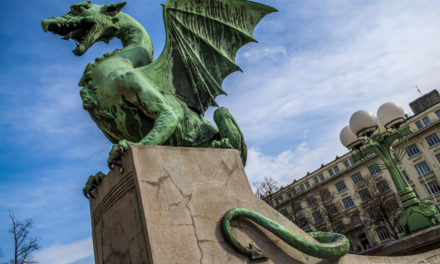 How do I say it – Kaló taksídi or Asfalés taxídi!? thoroughly enjoyable recount-you shared with me parts of Alaska I never would have expected to hear about-and the food-i’m hungry already-also to travel to Alaska! Haha, thanks Randy! I was hungry writing the story, editing and proofreading it. Go figure – I think it’s time for lunch. Great article and pics! Gives me some ideas to plan a future trip to Alaska. Mine will also be centered around food, of course. Great job Michael!… “A taste of Alaska” is a delicious testimony to a fabulous journey!…You’ve confirmed my desire to visit that beautiful state. From a girl who’s been dieting all too long now, after reading this, I’m literally drooling at the thought of all that great fish ….and the pecan sticky buns!…Maybe Sharon would consider opening a “Two Sisters” here in Bordeaux instead? You’re a talented guy Michael. I’ve always known that!…And discovering another of your hidden talents is a real pleasure! Awe Laura, you are too sweet, thank you. 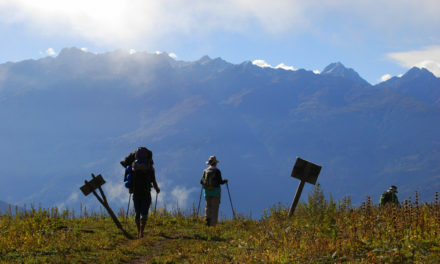 Vacation is a time to indulge – thank goodness we hiked almost every day. No need for you to diet, you are beautiful inside and out! Never mind ‘Two Sisters’ in Bordeaux, I need to come see you in Bordeaux, it has been WAY too long! Thanks Nancy, it really was amazing and a much needed getaway! I see a mini vacation in our future. I’m thinking Florida in January – are you in? Pookie, you are a natural!!! I loved it-where to next? Brazil??? Thailand?? Hmmm, my next travels? Imma coming to Jersey to see you, the hubby and kids! HA!! Missyouwitdat! Your post made me so hungry and want to book a trip to Alaska right now to try all the food you ate! You’re on Michelle – I’ll go back with you! Great to hear from you. Hope all is well. I think you and the Greek Goddess are my #1 fans! Miss you. What a great experience and adventure!! Don’t know, perhaps Maine? – there’s gotta be some good food there, right! Michael, why wasn’t I invitd on this trip? Oh wait…I was! Also, I thought we were Bff’s? So confused. In seriousness, great writitng and photographs, Alaska should hire you as their marketing department! Suzanne is the travel BFF, you are the Staten It-lee BFF! Ha, there is plenty to go around. 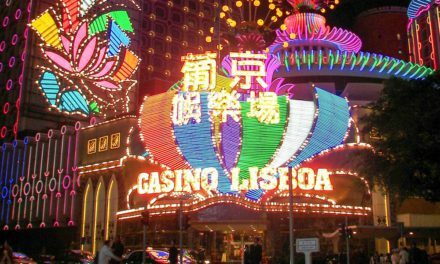 Next trip – you are coming! No ifs, ands or buts! Thanks so much! It’s a definite “not to miss”, that’s for sure. I did not pet Jack, he might think my arm is a branch and eat me. The food was truly out of this world. I’ll keep you posted on upcoming adventures. We can travel anytime – just don’t tell Curry, she’ll want to come along. 😉 Remember, all meals should be eaten at the appropriate times! Michael, you are truly a great writer,how did you hide the talent from us for so long? You honestly make me want to skip Turkey and go straight to ALaska!! WAIT! Can you take me to Turkey with you? Hi Michael! I enjoyed reading about your Alaskan adventure! All the fresh fish really made me reconsider this whole vegetarian thing – I mean, right of the boat is the way to go! I would have to say if (when?) I travel to Alaska I will have to try both the fresh salmon and the codfish tacos! Your writing found the perfect balance of tour guide/“Walden Pond” guide (transcendentalist?) – I look forward to reading about your next adventure! Thanks Julie. See you at PSC, we can pretend we are hiking the glaciers! HA! Oh Juno – you like the one part that I actually didn’t write. Those were the guide’s words, ha. All and all it was amazing. Korea next or shall I wait until the Olympics?? Toscana misses you, little Kiwi and brother Loon. Come back soon! What, no Nuts4Nuts cart in Alaska?? What kind of place is this? Ha. Great travelogue, Michael. Your wonder is infectious. Awesome article! Through your eyes I can see the world(lol).